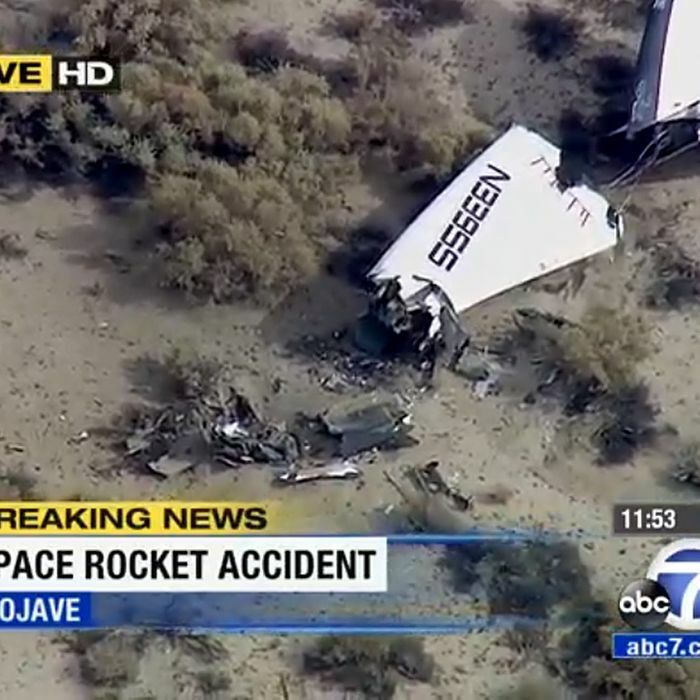 At least one pilot is dead and another seriously injured after Virgin’s commercial spaceship experienced an “in-flight anomaly” on Friday afternoon over Mojave, California. SpaceShipTwo took off attached to its mothership, WhiteKnightTwo, and was released at 50,000 feet, where it’s supposed to accelerate, eventually hitting Mach 3.5. The long-delayed project, courtesy of eccentric billionaire Richard Branson, is supposed to take six passengers and two pilots into space as soon as 2015, but had not been flight-tested in nine months before today. Virgin Galactic’s partner Scaled Composites conducted a powered test flight of SpaceShipTwo earlier today. During the test, the vehicle suffered a serious anomaly resulting in the loss of the vehicle. The WhiteKnightTwo carrier aircraft landed safely. Our first concern is the status of the pilots, which is unknown at this time. We will work closely with relevant authorities to determine the cause of this accident and provide updates as soon as we are able to do so. Ss2 blew up. Came down in pieces. At one of debris sites. Saw on of crash sites. Body still in seat. Back in Mojave now. Ss2 had trouble with engine burn, blew up, came down in pieces near Koehn Lake.